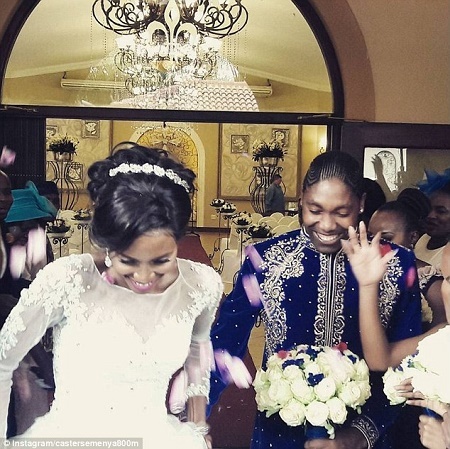 A South African Olympic gold medalist, Caster Semenya has married her long time partner in an elaborate ‘white wedding’ ceremony yesterday which coincided with her birthday. According to Dailymail, the 800m Olympic gold medalist wore a ‘Prince Charming-style’ outfit of embroidered jacket, gold breeches and velvet slippers for the ceremony which saw her wed Violet Raseboya, who wore a full-length white lace and appliqué dress. The overjoyed athlete took to Instagram to share photos of the ceremony. The event which took place in the capital, Pretoria was attended by the couple’s friends, relatives, scores of local celebrities and athletes, followed a traditional ceremony a little over a year ago when Caster, who turned 26 yesterday, reportedly paid a dowry of £1,500 to her bride’s family. Caster’s victory at the Olympics in Rio last summer was the most bitterly contested event of the games – and she credited Violet, 30, and her home fans with providing the strength and confidence to confront her critics, or ‘haters’ as she called them. The runner, who has naturally elevated levels of testosterone and was forced to undergo humiliating gender testing to prove she was female, was once forced to take medicine to suppress her testosterone amid claims she had an unfair advantage. The rules have since been challenged which means she can now compete without the medication, which provoked protest from her fellow competitors in Rio. She was born with no womb or ovaries and instead, due to a chromosomal abnormality, internal testes.